The United States Mint has announced the design selections for the 2014 America the Beautiful Quarters. The five coins to be issued in the coming year will feature Great Smoky Mountains National Park in Tennessee, Shenandoah National Park in Virginia, Arches National Park in Utah, Great Sand Dunes National Park in Colorado, and Everglades National Park in Florida. These will represent the 21st to 25th overall releases within the program. The America the Beautiful Quarters program was launched in 2010 and has featured five different coins per year, with reverse designs representing national parks or sites. The series is scheduled to run through 2021 with a total of 56 different coins featuring a site for each state, U.S. territory, and the District of Columbia. The sites are presented in the order federally designated. 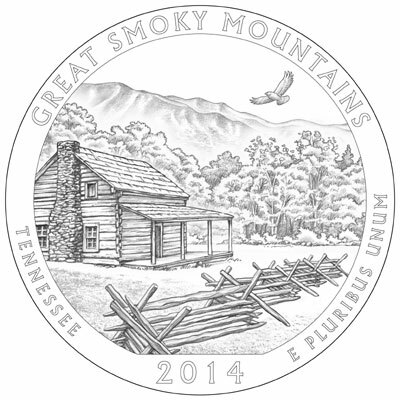 The reverse design of the Great Smoky Mountains National Park Quarter includes a depiction of a historic log cabin found within the park. A segment of lush green forest and a hawk circling above are also included. Inscriptions read “Great Smoky Mountains”, “Tennessee”, “E Pluribus Unum” and “2014”. The reverse was designed by Chris Costello and engraved by Renata Gordon. 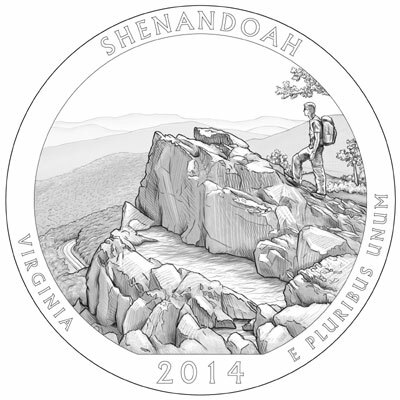 The Shenandoah National Park Quarter features a hiker taking in the view from the Little Stony Man summit. The inscriptions include “Shenandoah”, “Virginia”, “E Pluribum Unum”, and “2014”. This was designed and engraved by Phebe Hemphill. 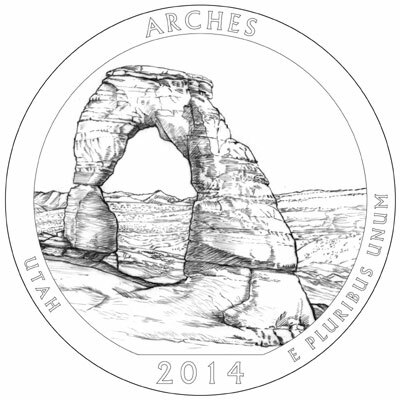 The reverse of the Arches National Park Quarter depicts Delicate Arch, a 65 foot free standing natural arch, as designed by Donna Weaver and engraved by Charles L. Vickers. The La Sal Mountains are also visible in the background. Inscriptions around the scene include “Arches”, “Utah”, “E Pluribum Unum”, and “2014”. 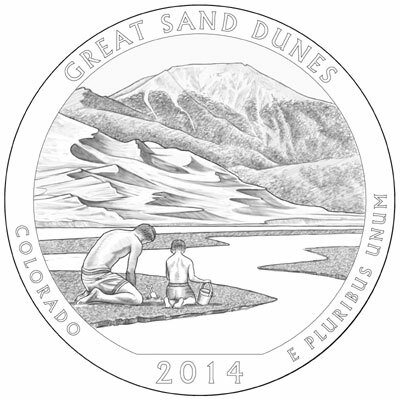 The Great Sand Dunes National Park Quarter features a depiction of a father and son playing in the sane next to the creek bed. The background includes the distinctive mountains and sand dunes of the park. Inscriptions read “Great Sand Dunes”, “Colorado”, “E Pluribus Unum”, and the date “2014”. The reverse was designed and engraved by Don Everhart. 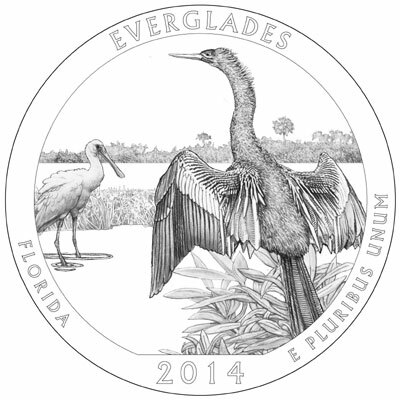 The fifth and final coin released for the coming year will be the Everglades National Park Quarter, which was designed by Joel Iskowitz and engraved by Joseph Menna. The design features an anhinga with outstretched wings on a willow tree with a roseate spoonbill visible in the midground. Inscriptions read “Everglades”, “Florida”, “E Pluribus Unum”, and “2014”. The obverse of all five coins will feature the 1932 portrait of George Washington designed by John Flanagan. The obverse inscriptions include “United States of America”, “Liberty”, “In God We Trust”, and “Quarter Dollar”. The 2014 America the Beautiful Quarters will be issued for general circulation as well as available within numismatic products offered by the United States Mint. The same designs will also appear on five ounce silver coins issued in both bullion and numismatic formats. Release dates for the quarters and silver coins are not yet available. Awesome! Can’t wait to attend the ceremony for the GSMNP and Everglades coins! 2014 looks to be a very good year for the ATB program. Although I only collect the 5 oz bullion and “P” versions of these coins, I think the best presentations for these designs will be found on the Proof coins offering sharp, frosted devices contrasting against the mirrored fields – similar to how Hawaii Volcanoes “popped” in PR last year. In the back of my mind, I also have visions of these designs incorporating the “enhanced finish” process; adding some impressive depth to the Shenandoah and Great Sand Dunes coins. Between these 5 releases and the Baseball Commemoratives, could be an upswing for the Mint and US numismatic collectables. Every Single one of these designs are FABULOUS and very fitting landscape designs. As a collector of the ATB P Mint collector versions, I look forward to obtaining these 2014 designs. A really terrific job by the U.S. Mint artist and sculptor staff! Excellent selections for ATB this year, silver proof should look fine! #2 : I don’t see any ideal to show the beautiful of the dune is. . I have collected seveal rolls from the mint on these America the Beautiful quarters. Been thinking about getting some graded but I dont know what or how to pick the ones I need to send in for grading. Anyone able to help me out with some info ?